ISIS has lost its final stronghold in Syria after a desperate battle which saw the so-called caliphate send female fighters to the frontline. Syrian Democratic Forces declared a 'total elimination' of the jihadist group this morning after flushing out diehard jihadists from their very last holdout in Baghouz. The terrorist group's bloody last stand saw fanatics hiding in caves as US-backed forces launched airstrikes overnight on Thursday. President Donald Trump declared victory over the self-declared caliphate, which once sprawled across much of Syria and neighbouring Iraq, yesterday. 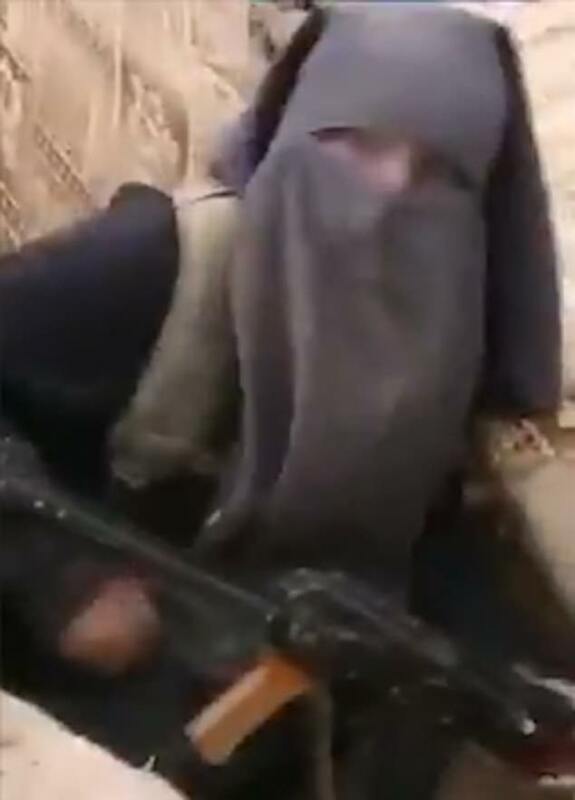 In the final days of the caliphate, official footage released by ISIS appears to show women in burqas firing AK47s at the SDF. Until now, women have been stopped from joining ISIS forces on the frontline as it is considered taboo. Devorah Margolin, a war studies analyst at King's College London, told the Telegraph: 'Isil has always been adamant that women should participate in violence only under circumstances of "defensive jihad", or in simpler terms only when Muslim lands are under attack and it is strategically necessary. Mustafa Bali, a spokesman for the Syrian Democratic Forces, tweeted that 'Baghouz is free and the military victory against Daesh has been achieved', referring to the group by its Arabic acronym. Bali said the so-called caliphate is gone, and pledged to continue the fight against remnants of the extremist group until they are completely eradicated. Prime Minister Theresa May said the fall of the last bastion held by ISIS marked 'a historic milestone' as she paid tribute to British forces and coalition partners. 'The liberation of the last (IS)-held territory is a historic milestone that would not have been possible without their commitment, professionalism and courage,' she said in a statement. British forces will not scale-back their presence in Syria and Iraq following the capture of the last remaining territory. Britain has committed nearly 1,400 military personnel to the region to support local forces, while the Royal Air Force has conducted more than 1,600 air strikes in Iraq and Syria, according to government figures. 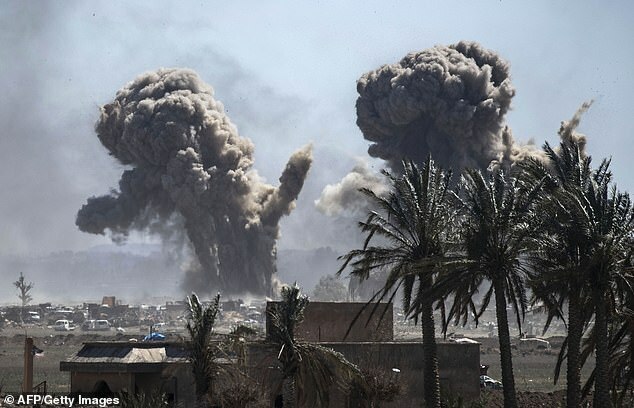 More than 630 civilians were killed in the six-month operation against the Islamic State group that culminated in its defeat. The civilian dead - among them relatives of IS fighters - included 209 children and 157 women, the Syrian Observatory for Human Rights monitoring group has said. The Britain-based Observatory said the operation had cost the lives of 730 SDF fighters while 1,600 jihadists were also killed. The group no longer controls any territory in Syria or Iraq, but continues to carry out insurgent attacks in both countries. It also maintains affiliates in Egypt's Sinai Peninsula, Afghanistan and elsewhere. The Kurdish-led SDF had been predicting imminent victory for days but while thousands of the terrorists had fled a few were still hiding in the Syrian village. The force has been battling for weeks to defeat Islamic State at the Baghouz enclave in southeastern Syria at the Iraqi border.